I do not want to, as the slogan suggests, "Taste the rainbow." If a Skittle accidentally fell into my mouth, I would spit it out. This is how I feel about most candy, except for Sour Patch Kids. My twin boys, though, like every other four-year-old on earth, LOVE Skittles. And all the other crack-in-a-wrapper kids get at Halloween. The candy-consumption-negotiations began bright and early the morning after a late night of Trick-or-Treating. Isaiah came out of his room with his bag of candy slung over his shoulder, like a little Santa's sack. He stumbled down the stairs, focused on navigating the precious bag, as though it was worth its weight in gold. Before I knew what had happened, he deftly negotiated the potential consumption of one piece of candy after lunch. He then proceeded to remind me of our deal before breakfast, after breakfast, before preschool, after preschool, before lunch, etc. The candy of choice? A full size bag of Skittles. He and his twin brother waited all morning for their agreed-upon candy. This, for a four-year-old with candy on his mind, is like waiting a lifetime. Finally, a lifetime passed, and the candy was distributed in the few minutes we had to spare before leaving to watch their brother's school parade. Isaiah tore into his bag in the blink of an eye and before I could get a handle on the situation, it was half-eaten, then spilled and picked-up, twice. Foreseeing the potential for a disastrous candy spill at the parade, I turned to get a zip-lock bag for both boys so I could pour their candy into separate preschooler-compatible packaging. I sat Levi's candy on the counter, hoping to open it for him and avoid a repeat of Isaiah's spill-and-pick-up performance. I forgot, though, that a four-year-old tears into a candy-wrapper like a squirrel attacking a plastic feeder full of sunflower seeds. Place a thin layer of plastic between a toddler and a handful of sugar and stand back – all sorts of destruction is sure to ensue. During the brief moment my back was turned, I heard Levi’s bag of Skittles explode. A rainbow of sugar shot all over the kitchen floor. I spun around and discovered that he'd ripped open one whole side of his bag with one swift, semi-miraculous, yank. Skittles rained down, and scattered (or would that be “skittled”?) under the island, across the rug, and behind the heavy iron radiator. This was a crisis of epic proportions. 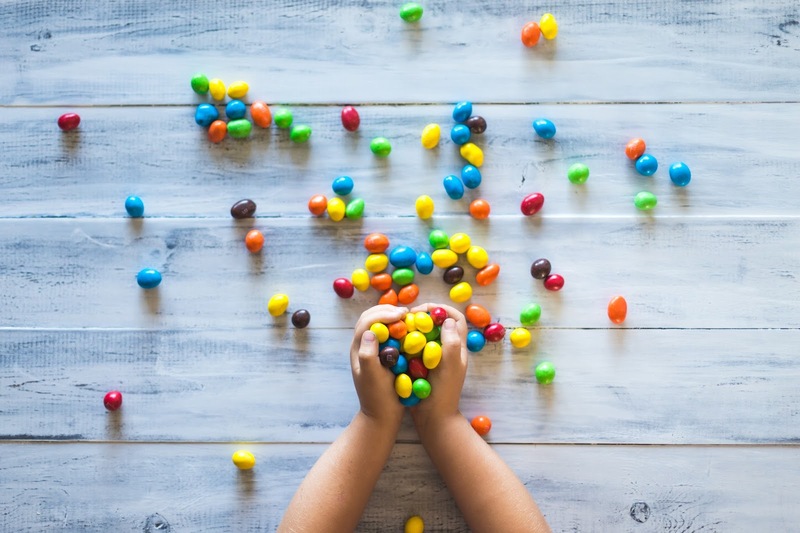 Children hunt spilled candy like the women hunting her one lost coin in Luke's gospel; kids hunt lost candy with the kind of determination and passion that God’s hunts lost souls. Levi immediately started crying while Isaiah quickly began grabbing and eating every one of his brother's Skittles he could find. This was less than twenty-four hours after Trick or Treat and I had already had it Up To Here with sweets. I wanted to explode like that bag of Skittles. I wanted to hunt down the person who thought it was a good idea to give little people bags of candy bigger than their faces. I wanted to scream and stomp on the candy in a fit of rage. I dug deep inside myself and caught a glimpse, for a brief moment, of the rainbow shining right in front of me. I saw how every moment has a rainbow and - everyone knows - rainbows lead to hidden treasure. Rather than breaking the moment further, I somehow saw and embraced the invitation to be the hero - I reached for the pot of gold. I knelt down beside the crying boy and the thieving boy and began gathering candy. With due diligence, most of the loss was recovered. We put the rainbow in a new bag and I zipped it tight. Then, we ran out the door together, two boys clutching baggies of brightness and one Mama carrying a rainbow in her heart. By the way, we did miss one red Skittle. This, I know, because the dog found it . . . and spat it out. Even the dog knows better.